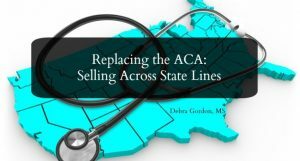 A cornerstone of every Republican plan to replace the Affordable Care Act (ACA), including the president’s plan, is to allow health insurance companies to sell their products across state lines. The Republicans claim this will increase competition and drive down costs. 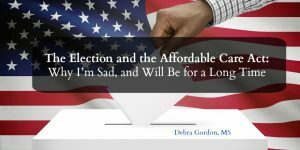 Health policy experts, including the National Association of Insurance Commissioners and the Center for Insurance Policy and Research, say it will do exactly the opposite: Drive up costs and reduce choice, particularly for those with medical conditions. First, a bit of background. States regulate all small group and individual health insurance policies through their insurance commissioner, although the federal government sets certain minimum requirements that plans must offer, like the 10 essential benefits required under the ACA. States can mandate that their licensed insurers add certain benefits, like infertility coverage. They also determine how much older people can be charged for premiums on the individual market and how much money insurers must have available to pay claims. Yes, it’s a mess. No, I’m not talking about 17-year-old’s bedroom (the mounds of laundry on the floor and 15 empty Gatorade bottles on his desk are fodder for another blog) but, of course, healthcare.gov, the web site that is the gateway to individual insurance for millions of Americans but which, unfortunately, is working about as well as Congress. In case you haven’t noticed, I’m a pretty big advocate of healthcare reform and, despite its many flaws, the Affordable Care Act. Which is why I feel like curling up in a fetal ball in the recesses of the teenager’s (scary) closet and not coming out until an entire day goes by without a story on NPR about healthcare.gov. Unfortunately, I still have to earn a living so the closet is not an option. So I will face the critics and admit it. Yes, the Obama administration screwed this up in the most humiliating, embarrassing way. Then I will tell them what I tell my kids: Now what?